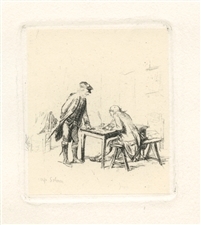 Jean-Louis Meissonier original etching "Le Sergent Rapporteur"
Medium: original etching. Catalogue reference: Beraldi 14. This impression on chine colle paper was published by the Gazette des Beaux-Arts in 1903. Plate size: 2 1/2 x 2 1/8 inches (63 x 55 mm). Not signed. Jean-Louis Meissonier etching "Une Chanson"
Medium: etching (after the painting). Etched by Mongin after Meissonier. This impression is from the rare 1897 portfolio "Art et Nature" by Leon Roger-Miles, published in Paris by Boudet in an edition of 525. Printed on Marais wove paper, the image size is 5 1/4 x 4 inches (132 x 104 mm). Signed in the plate, not by hand. Condition: there is foxing in the margins, not affecting the image. Jean-Louis Meissonier etching "Jeune Homme"
Medium: etching (after the painting). Etched by Rajon after Meissonier. This impression is from the rare 1897 portfolio "Art et Nature" by Leon Roger-Miles, published in Paris by Boudet in an edition of 525. Printed on Marais wove paper, the image size is 4 x 2 1/2 inches (98 x 65 mm). Not signed.